Often enough, I happen to see a beautiful sunset when I’m in the middle of a housing area or similar, with lots of utility posts and wires mangling the view, or a very plain area with nothing of interest other than the sky itself. Always stop, you never know when the shot will the the ONE 🙂 Ugly spots won’t matter when the sky is that nice. I think it’s a law of the cosmos – the beauty of a sunset is inversely proportional to the attractiveness of the available foreground 🙂 You’ve done a good job finding something interesting here! This is beautiful, Michael. Certainly not a scene we’d see in our suburban landscape! The silhouettes of the palms are beautiful against the colors in the sky. Hi Mike!! 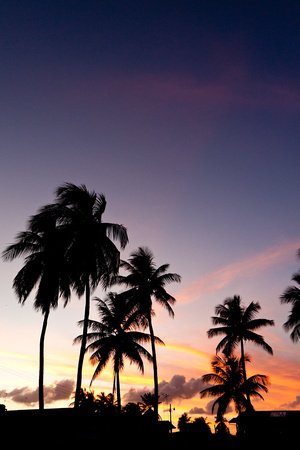 Love the silhouettes of the palm trees, wonderful. Thanks David, great hearing from you!